David Caines, Chief Operating Officer at Kenco Logistic Services, speaks about his job and company during a meeting at his Chattanooga office on Monday, February 9, 2015. 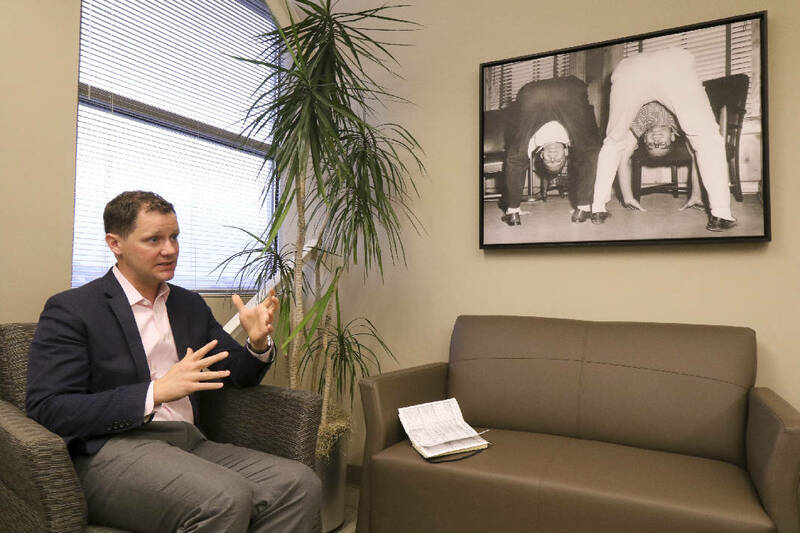 Caines keeps a lighthearted image of the company founders Sam Smartt and Jim Kennedy Jr. on his wall to motivate employees to be open with him. Founders: Jim Kennedy, Sr., Jim Kennedy, Jr., and Sam Smartt, Sr.
CEO: Jane Kennedy Greene, daugher of founder Jim Kennedy Jr.
Owners: 10 shareholders from the Kennedy and Smartt families. Fairness. People deserve fairness from their employer, manager, and supervisor and respect it, even if they may not like the results for themselves personally. Honesty and integrity. Honoring your word, being upfront with customers and associates during good and bad times, is paramount to our success. As my father was fond of saying, "The only way through trouble is straight through it." Respect. "To whom much is given, much is required/expected." Our ownership and management team must earn the respect of our associates up, down and sideways every day. There is never a place for a sense of entitlement from anyone in our company. Hard work and fair compensation. From the beginning our success hinged on us having "a bad case of the want to's". No one is owed employment or compensation without measurable contribution. Frugality and attentiveness to costs. These qualities are appreciated by customers and associates and are critical to any organization's survival. Desire to please. Striving to please is a driving force that differentiates Kenco from other companies. Empowerment. Employees should feel free to make decisions for which they are accountable. Allowing people to feel they are making a difference makes them more passionate about their work. Camaraderie. Having a common denominator with customers, suppliers and fellow employees creates an important bond in these relationships. Empathy. We must always strive to see things from the perspective of the "person on the floor". These people are the back bone of our company and they should always feel appreciated for their commitment to our success. Communication. Everyone needs to feel a part of an effort. Being informed about what is expected of each employee and having that communicated on a timely basis goes a long way toward ensuring this. When David Caines was preparing to graduate from Covenant College and looking at his career options more than a decade ago, he got some helpful advice from then college president Frank Brock. Brock, whose own family had long operated Brock Candy in Chattanooga, suggested Caines should try to find a job with a family-owned business. Such companies, Brock advised, are often more interested in long-term survival than short-term profits. Caines found his opportunity in 2002 when he joined a subsidiary of Kenco Inc., the Chattanooga-based logistics company owned by the heirs of company founders Jim Kennedy, Sr., Jim Kennedy, Jr., and Sam Smartt, Sr. Less than 13 years after joining the company in Memphis, Caines was elevated last year to chief operating officer of what has grown into the nation's biggest family-owned warehouse and logistics company. "It's exciting to build on the great heritage and culture we have at Kenco," Caines says. "And as a family-owned business I think we have a lot of agility to adapt to changing markets without going through layers of bureaucracy you might find at other businesses our size." From its start in 1950 when the company was known as Cherokee Warehouses and had only two employees and a 100,000-square-foot warehouse in Chattanooga, Kenco has grown into a nationwide business with 4,800 employees and contractors and over 30 million square feet of warehouse. The company turns 65 this year, but is far from any retirement mode. In fact, Caines is optimistic Kenco can continue its double-digit annual growth in coming years even after achieving an average 10.3 percent annual growth pace over the past decade. "A lot of that has come from organic growth with exisitng customers," Caines says. "When we get our foot in the door, we've been able to prove the value of what we do and then our clients either add services or add markets." For all its size, however, Caines said Kenco "is not a giant" in the industry. Exel (DHL Supply Chain - Americas), for instance, has 10 times as many employees and five times as many warehouses as Kenco. "We're not the bigget in the industry, but we are the largest family owned and, the largest women-headed firm in the industry," Caines says. "We don't necessrily have the widest service to offer snce we're not the biggest, but we are relentless about our customer service." Kenco tries to become one of the preferred suppliers for major companies. "Our goal is to be breaking into that business with new clients," Caines says. "Our history has been to get our foot in the door (through contract logistics) with a client and then we have pretty explosive growth from there." The typical Fortune 1000 company has been using third party logistic firms for 14 years. "Our average relationship with an existing client is 17 years," Caines said. Kenco's annual attrition rate of 2 percent is lessz than one fourth of the industry average of 9 percent. Kenco pioneered the industry's first dedicated contract warehousing arrangment with Dupont in 1967 when Kenco took over operations and logistics for a Dupont warehouse in Chattanooga. Today the majority of Kenco's business in now comprised of such dedicated contract warehouses. Caines credits much of Kenco's success to the company culture, which he says was established from the start of the company. As a tribute to the founders — and their commitment to not taking themselves too seriously — Caines third story office in the renovated former Pillsbury warehouse building on Amnicola Highway displays a photograph of the company founders Jim Kennedy Jr. and Sam Smartt Sr., bent over displaying their back sides. "We work hard and long hours, but that photo reminds me that we're going to have fun while we're here," Caines says. Another office wall painting in Caines office shows a Honduran dairy farmer who Caines says reminds him of all the hard work done by laborers in the business. "I have that because one of the things that Mr. Kennedy always has said and taught us is to never forget the person on the shop floor," he says. Kenco offers a more diverse array of services from warehousing, to shipping, to logistics handling than most of its competitors. For instance, one of the nation's biggest medical equipment and technology companies, Stryker Corp., employs Kenco as a kind of "rooms to go for hospitals" with a white glove delivery of all the beds and supplies for a hospital room completely installed by Kenco affiliate companies. Caines, 35, joined Kenco in 2002, most recently serving as president of Kenco Logistic Services and Kenco Transportation Services. In his new role, he is responsible for all of Kenco's operating contracts, which encompass more than 100 facilities, nearly 4,000 employees, and 30 million square feet of warehouse space. "Kenco's direction is clear," Caines said. "As a family-owned business with strong core values, Kenco has achieved solid, consistent growth with an evolving suite of logistics services. That's the base from which I want our team to move forward. It's a great honor to have been named to this position, and I am excited about leading a company that adapts, changes and grows by staying true to its founding principles." Caines is a Six Sigma Black Belt and is trained in Lean engineering. He has a degree from Covenant College in Business and Accounting and an MBA from Duke University. He is a member of CSCMP, WERC, and the University of Tennessee Supply Chain Forum. He also serves on the boards of various educational and nonprofit institutions, including: the University of Tennessee's Global Supply Chain Institute; Chalmers Center; Covenant College; See Rock City, Inc.; and the Chattanooga Chamber of Commerce. "We are delighted to have David take on the COO position," said Kenco Board Chairwoman Jane Kennedy Greene. "He's been very successful in creating common sense solutions that deliver uncommon value to our customers, and we look forward to him carrying on Kenco's culture and history of excellence." The culture has been stressed since the buisness began. "Integrity above profits is No. 1 for us," Caines said. "We're never going to sacrifice our integrity to make an extra dollar. The only way through a tough situation is straight through it." The company focuses on 3 Cs — Courage, commitment and compassion. "We're a service-oriented company, but one of the most courageous things we can do with our clients is to be the subject matter expert and the trusted advisor they have hired us to be and tell them when they are about to shoot themselves in the foot. He started with a Kenco subsidiary, KM Logistics in Memphis . "But I knew with Kenco eventually all roads lead back to Chattanooga," he said. Prior to joining Kenco Logistic Services, David held various positions with KM Logistics in Memphis, TN. KM Logistics provides a wide range of supply chain services for the Cummins Engine global after-market parts distribution center. David earned a BA in Business Administration (with a concentration in Accounting) from Covenant College and an MBA from Duke University. Kenco is looking to upgrade technology to help provide more information tools and expand in Canada.